In medium bowl, beat eggs and milk with wire whisk. Stir in cheese, garlic powder, basil, salt, pepper and onions. In 9- to 10-inch nonstick skillet with sloping sides (omelet or crepe pan), heat oil over medium heat. Cook potatoes in oil about 5 minutes, stirring frequently, until tender. Add spinach; cover and cook 1 to 2 minutes or until spinach is wilted. Reduce heat to low. Spread potatoes and spinach evenly in skillet; top evenly with tomatoes. Pour egg mixture over top. Cover; cook 12 to 15 minutes, lifting edges occasionally to allow uncooked egg mixture to flow to bottom of skillet, until bottom is lightly browned and top is set. Cut into wedges. 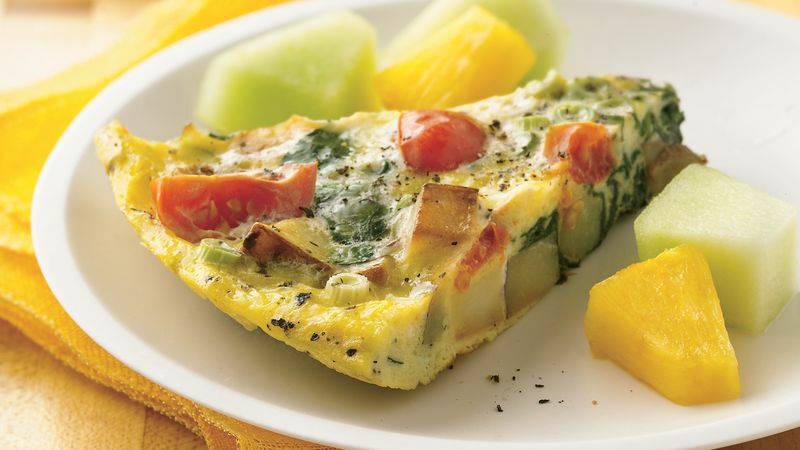 A fruit salad would be the perfect side dish to this frittata. Want to add an additional vegetable? Add some chopped yellow bell pepper or zucchini slices.